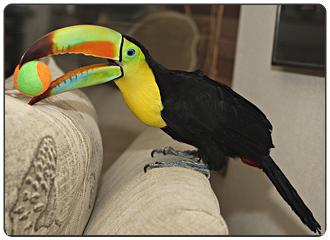 We acquired our pair of Rainbow Billed Toucans(Ramphastos sulfuratus) Leonardo & Twitchy several years back from Emerald Forest Bird Gardens at first to possibly breed them in a backyard Aviary. Well things sort of changed, We ended up keeping them in the house and since then they have became part of our family. They have adapted well and are very healthy to this day. I’ve owned an African grey parrot in the past, but the experience was never really quite the same as owning a pair of toucans. 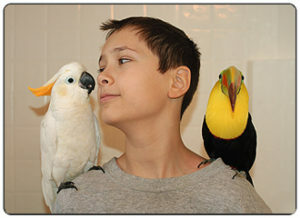 To this day, they both fly around the house freely during the day when someone is there and at night we put them in their bedrooms(cages). When they are out they interact with us a lot, they like to follow me around the house from room to room and demand my presence the majority of the time. There as been times were I’ll have to get my work done and they can be quite a distraction sometimes, so what I’ll do is make a run for my office when they’re not looking and slowly close the door so that if they are right behind me I wont close it on them. As time has gone by I’ve trained them to do a few tricks which was pretty easy, they are fast learners and have the ability to learn tricks just as proficient as parrots, I have an Avian Acrobat team, at least that’s what I call it, I have taught my female rainbow bill toucan to do back flips and my citron cockatoo to rollover, and they fly to me when I call them. I just love to show them off when we have people over which seem pretty impressed after the performance. Both toucans have a close bond with us, I have to say Twitchy is the one that requires the most affection, she just loves it when you pet her, she’ll start purring like a kitten demanding more. She always has to be around someone, it makes her feel comfortable, I’ll be sitting on the couch and within seconds she has landed on me and starts purring. I have been very pleased with the decision of getting my birdies and hope that each and everyone who owns these beautiful birds shares the same experiences that I’ve had.